← What Happened to Virginia Dare? Orville and Wilbur Wright’s first flight, December 17, 1903, at Kittyhawk, North Carolina (they flew at an altitude of 10 feet, and a distance of 120 feet). U.S. Air Force photo. August 19, Orville Wright’s birthday, was designated as National Aviation Day in honor of the brother who piloted the first powered flight. Read all about that first flight and the beginnings of aviation at http://www.knowledgehouse.info/njfkflight.html. For more information about the Wright brothers and flight, visit www.wright-brothers.org. The federal observation of National Aviation Day, which celebrates the history and development of aviation, was first proclaimed in 1939 by Franklin Delano Roosevelt. 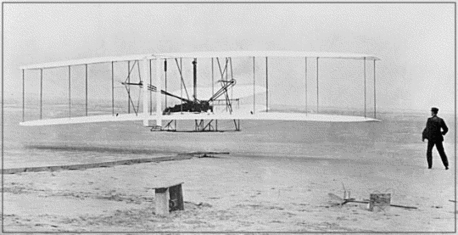 Orville Wright was 68 years old when the declaration was issued. All federal buildings and installations are directed to fly the American flag on that day, and citizens are encouraged to observe the day with activities that promote interest in aviation. http://www.first-school.ws/theme/transportation/aviation-air.htm – Aviation and air transportation themed educational activities for preschool and kindergarten. http://www.faa.gov/education/educator_resources – Educator Resources featuring curriculum and activities with an aviation theme, from the Federal Aviation Administration. Aviation Science Activities for Elementary Grades (PDF) – This manual is meant to be a springboard toward your own ideas for demonstrating concepts of the Air Age to your children, whatever the grade level. Even little children can learn scientific principles through simple teaching aids; older pupils can benefit by a review using the same demonstrations. In some instances, these aids may be set up by the teacher; in others, by the children as a group project; in still others, by each child with a minimum of teacher direction. From the U.S. Dept. of Transportation, Federal Aviation Administration. http://www.evergreenmuseum.org/education/teacher-resources – Curriculum resources, educational packets, and downloadable activities for teachers and students (whether you teach an entire class or home school your own children), from the Evergreen Aviation & Space Museum. Each activity strives to integrate aeronautic and Science, Technology, Engineering, and Mathematics (S.T.E.M.) related lessons with hands-on exercises. http://www.juniorflyer.com – Here you’ll find science and cartoons, games and history. There are videos, old and new, and stories about adventurous pioneers. If you are interested in flight you are bound to find something interesting at Junior Flyer. http://www.modelaircraft.org/education/education.aspx – AMA Flight School, an interactive learning activity that teaches kids about the basic principles of flight and flight dynamics, from the Academy of Model Aeronautics. http://airandspace.si.edu/education/onlinelearning.cfm – A variety of online activities from the National Air & Space Museum test your knowledge and demonstrate the principles of aviation and spaceflight. http://www.partsgeek.com/mmparts/parts_of_an_airplane.html – A glossary of airplane parts, a list of famous aircraft, and a collection of links for further information. http://en.wikipedia.org/wiki/List_of_aerospace_museums – A list of aviation and aerospace museums around the world. An aviation museum, air museum, or aerospace museum is a museum exhibiting the history and artifacts of aviation. In addition to actual or replica aircraft, exhibits can include photographs, maps, models, dioramas, clothing and equipment used by aviators. Aviation museums vary in size from housing just one or two aircraft to hundreds. They may be owned by national, regional or local governments or be privately owned. Many aviation museums concentrate on military or civil aviation, or on aviation history of a particular era, such as pioneer aviation, aircraft of World War II or a specific type of aviation. Some museums address the history and artifacts of space exploration as well, illustrating the close association between aeronautics and astronautics. Aviation: From Sand Dunes to Sonic Booms – A National Register of Historic Places Travel Itinerary. Much of America’s 20th-century history is inextricably linked to aviation. In celebration of a century of flight, this travel itinerary highlights more than 100 listings in the National Register of Historic Places–historic aircraft, airfields, research and testing facilities, aeronautical and engineering research laboratories, military installations, battle sites, launch and control facilities–that tell the stories of the significant people and events that made the United States the world’s leader in aviation. This entry was posted in 600 Applied Science & Tech and tagged aircraft, airplane, aviation, flight, invention, inventor, orville, plane, wilbur, wright, wright brothers. Bookmark the permalink.